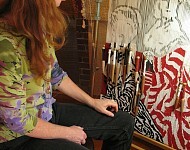 The public is invited to attend one or many of the ongoing events to learn about this beautiful art form. 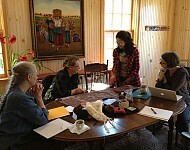 Maine weavers Emi Ito of Bath, Susan Perrine of Woolwich, Sheila Shanti of Westbrook, and Sybil Shiland of Standish will be on hand during different days to weave on looms and to answer questions. 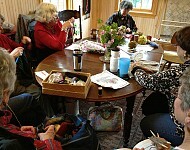 Guest weavers from all over the State will join this group at various times to showcase weaving techniques. 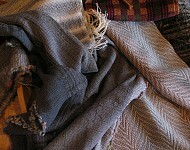 An exhibition of woven work, special looms and weavers' tools will be displayed throughout the Gallery, and The Red Studiowill be turned into a working weaver's studio. 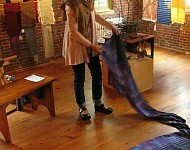 Visitors will be able to watch a warp being made, a floor loom being warped, and the weaving of cloth. 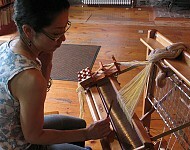 Several stunning examples of floor looms will be present (including a 36-inch Harrisville and a Japanese Saori), and weavers will also demonstrate the use of table, rigid heddle, tapestry and inkle looms. 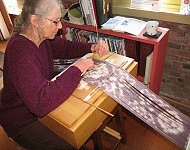 Weavers will show visitors how to construct a simple loom with heddles and treadles, or to create a card loom that uses only tapestry needles and cardboard to create small woven purses, belts or fabric. Admission is free for all demonstrations, the exhibition, and the sale. The Weave-In is planned as an opportunity for artists to share ideas and inspiration by working together over a continuous period of time in a common location. 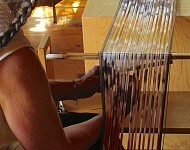 It also provides an opportunity for visitors to meet the artists, to learn more about the craft of weaving, and to view the exhibition of handwoven work. 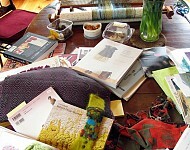 A sale of woven items—including artwork, wearables and pieces for the home—created by many of Maine's finest contemporary fiber artists will be available for purchase.